This chapter provides a detailed overview of some of the primary spectroscopic methods that have contributed to the current understanding of molecular nanomagnets (MNs). These include: electron paramagnetic resonance (EPR); optical spectroscopy, including magnetic and X-ray magnetic circular dichroism (MCD/XMCD); inelastic neutron scattering (INS); and muon spin rotation (μ +SR). For each technique, a historical survey of the most important discoveries is provided, up to and including the most recent developments. Each section gives an introduction to the theoretical principles underpinning the techniques, as well as a description of experimental requirements and protocols. A common theme among the described spectroscopies is the fact that state-of-the-art measurements typically have to be performed at major research facilities such as synchrotrons (terahertz EPR and XMCD), high magnetic field laboratories (EPR), and accelerator facilities or reactors (INS and μ +SR). Details of such facilities are given where appropriate. 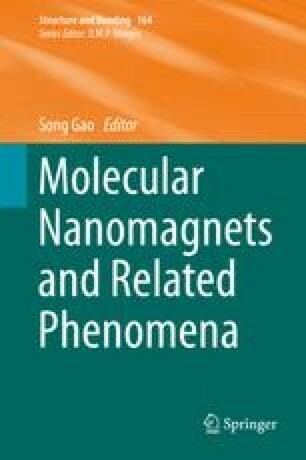 Forefront issues that are addressed in the chapter include: the fundamental properties of both mono- and poly-nuclear single-molecule magnets (SMMs); the deployment of MNs in quantum information processing applications; the addressing of individual magnetic molecules on surfaces or in devices; the probing of spin dynamics in MNs using EPR, INS, and μ +SR; and studies of long-range magnetic ordering in MN crystals. An extensive list of references is provided. The chapter is intended for physicists, chemists, and materials scientists, particularly junior researchers who are just starting work in the field. All of the authors are indebted to collaborators whose names can be found in a number of the references cited. MLB would especially like to thank Hannu Mutka, Hans-Uli Güdel, Tatiana Guidi, Stefano Carretta, and Paolo Santini; his recent research position is supported by the Army Research Office (W911NF-13-1-0125). SJB would like to thank Tom Lancaster, Francis Pratt, Richard Winpenny and Arzhang Ardavan; his research is supported by EPSRC and STFC (UK). ND acknowledges the Ministerio de Ciencia e Innovación of Spain for a grant under the program Ramón y Cajal. SH would like to acknowledge the NSF (DMR 1309463) and the Air Force (AOARD grant #134031) for financial support. Work at the NHMFL is supported by the NSF (DMR 1157490) and the State of Florida.